I am friend of Popular Book Store. I mean, I love their stuff. They re-designed, evolved in the recent year, into a book store which never failed to provide good books for locals. I got this recommendation from a friend last week. 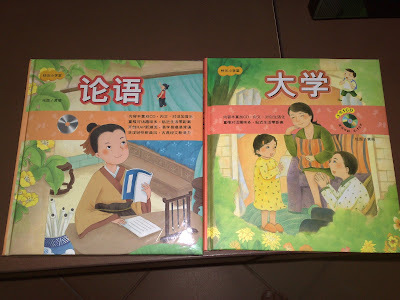 Great series, Confucius teaching with simplify Chinese and Hanyupingyin (汉语拼音). You have kids and you want to teach them Chinese better than French. You want to learn Chinese that is beyond the local TV. You think Chinese is cool. To further your enthusiasm, these books are sold at below SGD10 each, includes a CD, and Popular book store no frill packaging. It is running out fast as I type this. (Link)NS, Fake feathers could take the drag out of flights.